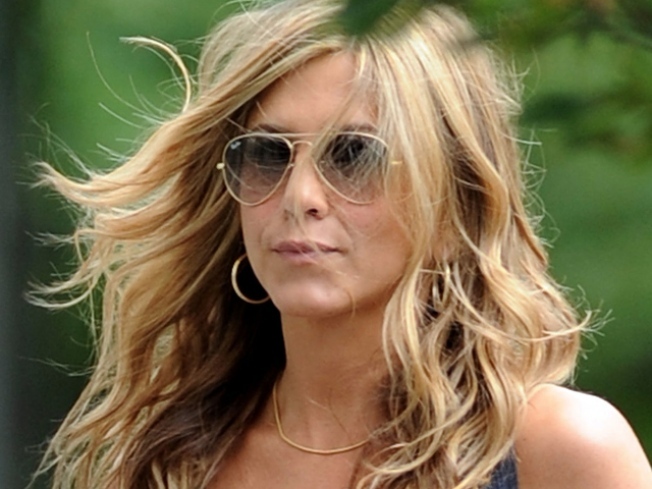 Jennifer Aniston sightings on the streets of Manhattan abound as the actress is in NYC filming The Bounty. Jennifer Aniston hit the red carpet for the New York City premiere of "The Bounty Hunter" on Tuesday night, and Access Hollywood got a smile out of the actress when we asked her about her newest co-star – Heidi Montag. As previously reported on AccessHollywood.com, Heidi will film a cameo role this week for the 2011-due Adam Sandler romatic comedy, "Just Go With It," a movie also starring Jennifer. "I just heard that," Jennifer said about her new co-star. "That's interesting and fun." Jennifer didn't offer any details about "The Hills" star's part in the film, which also features Nicole Kidman and Andy Roddick's Sports Illustrated model wife, Brooklyn Decker, but said the role suits Heidi well. "She's gonna do – she's… perfect," Jennifer said. As for "The Bounty Hunter," Jennifer said she was thrilled by the turnout at the movie's stateside red carpet event. "That's one of my favorite parts of, you know, coming to premieres, is getting to, you know, meet, see the fans," Jennifer said. "I think we need to do more of that – all over the place." And Gerard Butler, Jennifer's "Bounty Hunter" co-star, also enjoyed seeing the packed crowd that turned up to flank the red carpet. "It's fun," he said. "I mean, it does get a little intense really, when you have hundreds of people and they're all screaming at you and it's kind of… a bit of an assault on the nervous system and I think, no matter how many times you do it, it all… it's still so intense. But it's great."